Richie Hawtin has curated a line-up of fellow techno luminaries, each of whom add a different facet to the Printworks Issue 002 closing party. 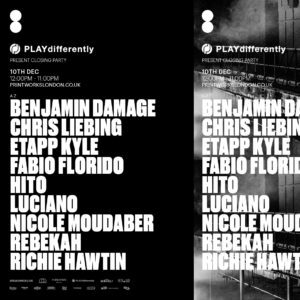 The event features five Ambassadors of Hawtin’s PLAYdifferently MODEL1 mixer: Chris Liebing, Luciano, Nicole Moudaber, Fabio Florido and HITO. Rebekah, Benjamin Damage also join the line-up and will play on the MODEL 1 mixer. They’ll be joining Fabio Florido in the intimate surroundings of the Charge Bay. There are also a couple of slots up for grabs in our PLAYdifferently MODEL 1 Open Decks offering– in conjunction with Richie Hawtin. You too could join the line-up as we’ll be hosting open decks for ticket holders. If you have a ticket to the show and want to test out the mixer in an amazing club environment email info@playdifferently.org. This is your chance to play the MODEL 1 mixer, at the closing party of Issue 002 at Printworks.